Since I was raised by a Japanese mother, potatoes only made rare appearances at our table. It’s not that any of us outright disliked them–although my mother may have considered them an inferior food, but many cooks tend to cook along the same lines as their “teachers,” who in in my case was my mother. Then I married a Dutchman. Naturally, he loves potatoes and considers them an essential part of any diet (although potatoes are one of the first things I would suggest eliminating if one was going to attempt to “diet”). I cook regular “white” potatoes very infrequently since I am predisposed to consider them an inferior food–certainly inferior in taste and nutritional value to the delicious and colorful sweet potato. However, in order to appease the Dutchman, I keep alert for interesting ways to prepare and serve traditional potatoes. I recently stumbled upon a recipe in one of my Sunset magazine issues that I’ve modified slightly here. The recipe is similar to one I used to make where you “smash” the potatoes then sprinkle them with parmesan and parsley. 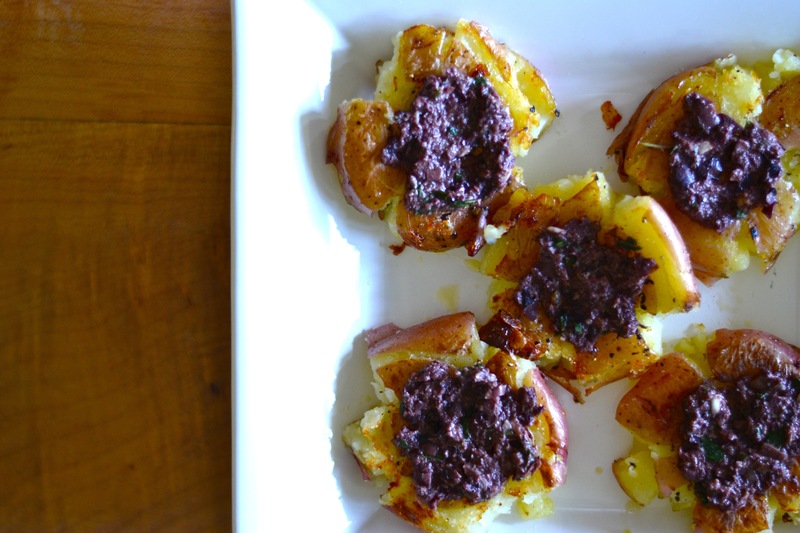 These potatoes are easy to prepare and very flavorful thanks to the tapenade-style pesto. And this dish uses small red or Yukon Gold potatoes which are certainly superior in texture and flavor to the regular old white potato. These potatoes make a nice accompaniment to grilled meats or a substantial fish dish. Put the potatoes in a large pot. Cover with water, add a large pinch of salt and put on the stove. Bring the potatoes almost to a boil and cook until easily pierced with a knife, about 15 to 20 minutes then drain them. While the potatoes are cooking, prepare the “pesto.” Puree the garlic and basil in a food processor. Add the olives and oil and pulse to a paste. Scoop everything into a small bowl and stir in the cheese. When they potatoes are cool enough to handle, set them one at a time on a large cutting board and “smash” (slightly flatten) each one using a small pot or skillet. Place them in a lightly oiled skillet (preferably cast-iron) over medium-high heat. Pan roast on the first side until slightly brown. Flip. Spread each potato with about 1 tbsp of the pesto and continue to cook until crisp on the bottom. Serve warm with a sprinkle of parsley if you like.